This week: Are You Stuck? Let's Find A Solution! We all get stuck from time to time. Don't panic! There's usually a solution. This week's Action/Adventure Newsletter is all about problem solving. I’ve been out of action these past weeks. Injured my back and legs and couldn’t move for a while. Apart from it being an unpleasant experience, obviously, it also didn’t at all help my plans to redecorate my house before my sister and niece come over to visit me later this month. And it didn’t help my studies and essay writing. Yeps, of course I had a deadline right at that time. Whilst my legs are feeling better, my back is still not right. I’m no longer stuck on one floor of the house, but even a visit to the village shop, which is basically right around the corner, is problematic. That meant that I have had to find solutions, like having my groceries delivered. Today, I had a hairdresser come to my home, and I have to say that she did a brilliant job. I had many plans for my writing at the beginning of this year. There were contests that I wanted to enter, for example. After having a writer’s block for a good while I was finally getting back into the creative zone when this happened. Life’s like that, unfortunately. But I am finding solutions for that, too. It may sound like the most obvious thing in the world, but how many of us still use pen and paper when writing a new piece? I used to do just that for my poems, scribbling down lines, crossing out words until I had something that I thought read well. Then I’d type it out and play around with it some more. I don’t know why I stopped doing that. At what point I went straight to my laptop when I wanted to write. I just know that I did. I have to say it’s quite nice to be using pen and paper once more. A bonus of having writing materials next to my bed is that if a line enters my mind right before I go to sleep – which happens all too often – I can just scribble it down instead of grabbing my laptop. I’ve learned that I shouldn’t believe myself when I think that I don’t need to note it down, that I will definitely remember it when I wake up, because the majority of the time I don’t. Noting it down doesn’t actually mean that it’s any good when I look at it during the light of day, but sometimes there’s something I can work with and that makes the noting down a worthwhile effort. A friend of mine takes a little notebook with her everywhere she goes. It contains plenty of lists, but she also uses it for writing down random thoughts, coming up with designs for clothes and whatever else pops to mind. It’s a good idea, really. The same goes for the process of writing something new. It’s not unusual to get stuck. At least, not for me. Have you ever written a line you love, only to discover that you can’t come up with something suitable that rhymes? The best solution I have found is using RhymeZone . Are you, like me, terrible at coming up with names for your characters? Try a site for finding baby names. There are some that tell you the meaning of each name, which can help you find one that suits a specific character. Are you stuck for something to write about? Check out the Writing.Com main page, which offers prompts, or one of the many contests. Coming back to the use of paper and pens, apart from being handy, it’s a perfect excuse for purchasing new stationary. I don’t know about you, but I love stationary. See? There’s a bright side to everything. 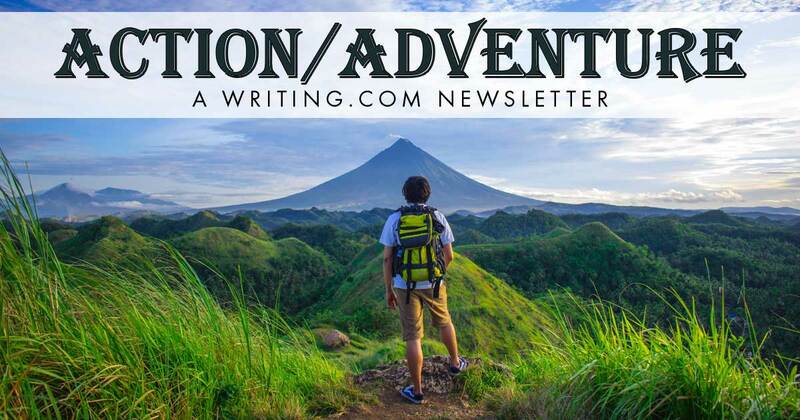 The Action/Adventure Newsletter Team welcomes any and all thoughts, questions, suggestions and feedback, so please don't hesitate to write in! Generated in 0.96 seconds at 6:10am on Apr 25, 2019 via server S30.